Clean and optimize your Mac. 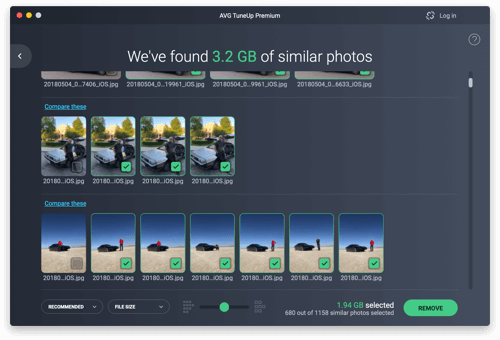 Get rid of junk files, duplicates, bad-quality photos, and enjoy all the extra drive space you forgot you had. Rediscover a cleaner, lighter Mac and free up space for your more important files and memories. Our Mac cleaner uses a multilayer system to tune up your performance to the next level. 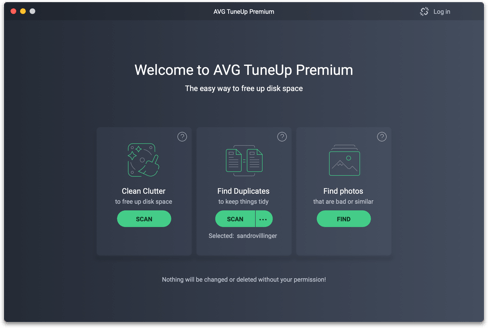 AVG TuneUp quickly finds and cleans out junk that’s lurking on your Mac. We’ll identify what you don’t need and make sure it’s all safe to remove. We’ll clean out junk automatically, while making sure not to delete anything important. Choose your settings and then we’ll do the rest. You’d be surprised how many accidental copies of documents, photos, movies, downloads, and other files there are hiding on your Mac. Let AVG TuneUp find and remove them so you can enjoy a lighter, faster Mac. The better your camera, the larger each photo. It’s a chore to sort through them all and delete the bad ones to reclaim disk space. Fortunately, our AI-powered Photo Finder can do that for you.